Now, many are even questioning the prospect of ownership and thinking about the pros and cons of renting. As a former Realtor and an investor, I have some views on this topic. First, whatever your inclination, whether to rent or to purchase, consider two things: your financial circumstances and your timeline. If both of those things are iffy or in a state of flux, you’ll probably be better off, financially and emotionally, by renting. But, if you have the financial means to purchase ( AND you enjoy living in a house), home ownership offers many benefits. What are the financial means? You have saved enough money for an adequate down payment, including closing costs, moving, and any refurbishing you require. Additionally, you have a secure and steady income to support mortgage payments, taxes, and maintenance. The rules of thumb here – that should allow you to sleep comfortably at night – are 20% cash in savings, and one week’s salary for “rent” or monthly housing costs. Mortgage underwriters deviate from this protocol slightly, but I’m trying to be conservative. I like sleeping soundly at night. What are the benefits? For me, it has always been about identity. This is a psychic benefit. This house is mine; I can keep it the way I want, I can do with it what I want, within reason, of course, and certain zoning regulations. Another benefit is a financial one. I’m not talking about flipping, or expecting the value to rise forever. But I am talking about the financial benefits of leverage that a mortgage offers. In the long run, it’s about forced savings, currently with a tax advantage, that enables a homeowner to put equity into a physical asset. And, way down the road, hopefully reap financial benefits, adjusting for timing issues. There are very few investments that allow someone to occupy, live in and enjoy as asset, while building up equity and deducting the payments from personal income taxes. That tax benefit may be compromised in the future, but it doesn’t negate the other financial benefits. All of this makes one underlying assumption: that one purchases wisely and responsibly. But that is a subject for another blog. Let me say in closing, that I have always found home ownership a rewarding experience. No one has been more attentive to, or restricted by, the question of “who are you to write a book?” than me. To put it another way, “what do you have to say that hasn’t already been said?” Those two questions have inhibited me from publishing a book – until recently. True, I am not a woman of note or notoriety. I am not famous, nor have I accumulated a roomful of medals or awards. So why would anyone want to read a book about the places I’ve lived, or anything about me at all? Here’s why: the story of my life, as viewed through the lens of the places I’ve lived is a unique and interesting way to document the life of an educated woman of the last half century up to the present time. It happens to be a good read, and all I ask of my readers is that they enjoy reading about the journey I have taken. With any luck, parts of my life will resonate with some of those readers and we will communicate, at least subliminally. And that is what most writers, and certainly I, hope for. My guiding principle in addressing those above-mentioned nagging questions has been: Monet painted haystacks. Haystacks may be ordinary, but in the hands of a skilled painter, they have become art. I believe that my little book, My Address Book: A Way of Remembering, is a form of art as well. And art, on any level, is a way of communicating. 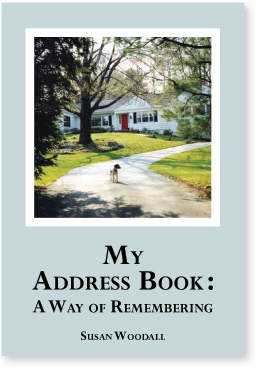 “My Address Book: A Way of Remembering” is available on sale at Amazon.com.